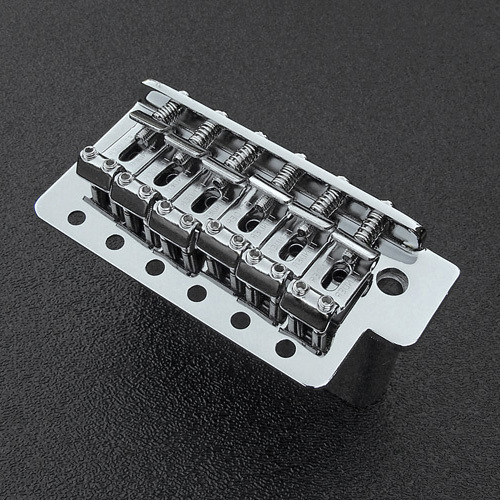 Genuine Fender® Standard Strat® Left Handed Chrome Tremolo Bridge Assembly. 6 point pivot mounting system. Includes polished chrome 'FENDER' stamped saddles. Saddle string spacing width of 2-1/16". Big block tremolo block. Accepts metric 5mm tremolo arm (not included). Fits import Strat's with 2-1/16" mounting spacing. This bridge will NOT fit the made in Mexico '50s, '60s & '70s Classic Series Strat's. Does NOT include mounting screws, springs, claw or tremolo arm. Ships as depicted in photograph on the right.